For the family reunion this past weekend, I had to make a hot dish & a cold dish. The hot dish was easy: homemade mac & cheese w/ diced ham & green peppers. *Mwah* That’s a fam fav so there was no question about making that particular dish. The cold item stumped me. Should I make a salad or a fruit plate? Cold pasta or pie? I perused the Kraft Foods website, which I have used for many meal ideas. Thank you, Kraft Foods! My search found “Quick Lemon-Berry Trifle.” Sounds daunting but I made it at 1 a.m. after a full day of work & three hours of driving to my mom’s house. My family devoured it; plus, they were surprised I had never before made it. Luckily I bought a lot of supplies, so I have enough left over to make another batch in the near future. Here’s the recipe [below]. 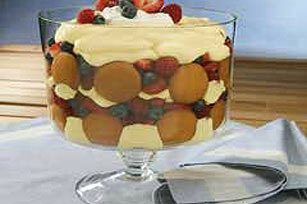 For nutritional info & a Flash instructional video, follow this link: Quick Lemon-Berry Trifle. POUR milk into large bowl. Add dry pudding mixes. Beat with wire whisk 2 min. or until well blended. Gently stir in 1-1/2 cups of the whipped topping. Reserve 1/4 cup of the berries; set aside. ARRANGE 21 of the wafers on bottom and up side of 2-1/2-qt. serving bowl. Spoon one-third of the pudding mixture into prepared bowl; cover with half of the remaining berries. Top with layers of half of the remaining pudding mixture, remaining 21 wafers and remaining berries. Cover with layers of the remaining pudding mixture, remaining 1/2 cup whipped topping and reserved 1/4 cup berries. Cover with plastic wrap.